The Syrian Republican Guard was established in 1976 as an elite force within the Syrian Arab Army essentially as an internal security force intended to protect senior government officials from attacks by anti-government insurgents and also to serve as a check on possible “Bonapartism” within the SAA. Since its establishment, it has enjoyed privileged access to funding and resources. Initially consisting of three mechanized brigades, each with a tank battalion and two or three mechanized battalions, its strength was later expanded through the addition of a separate tank battalion, three airborne and/or commando brigades, and two security regiments which provide bodyguards to senior officials including the President. The Republican Guard is staffed by two-year draftees drawn from all over Syria, though it also contains a large number of volunteers serving in key leadership positions. At full strength, the Republican Guard had some 25 thousand troops, though due to the wartime attrition, they are almost certainly lower. The Republican Guard has tended to be among the first units to receive the newest equipment, such as the T-72 MBTs. The privileged status of the Guard meant that being appointed an officer within its ranks was a sign of high confidence in the reliability of the individual and an avenue to rapid promotion, with many prominent Syrian officials, including President Assad, having served in the Guard. On the downside, the Guard suffered from the same problems as all “Praetorian Guard”-style formations suffer from: emphasis on loyalty rather than tactical competence, resentment from other military formations, exaggerated political ambitions of its senior officers. Like all elite formations, the Guard may be criticized for weakening the rest of the military by skimming the best recruits who, once trained, are kept out of the fighting because they are too valuable to risk. Indeed, the emphasis on its internal security role meant that the Guard played very little, if any, role in the Lebanese Civil War or the resistance to the IDF invasion of Lebanon in 1982, with possible exception of its commando units. The Guard command structure has tended to be dominated by Alawites. However, the entity also includes representatives of other major sections of the Syrian society. Indeed, one of the more prominent Syrian defectors in the early years of the war was Manaf Tlass, the son of the Defense Minister and a Sunni officer within the Guard who felt that even the privileged Guard posting was not a rapid enough avenue to promotion. Ultimately, however, the investment in the Republican Guard proved to be a sound one, as the force withstood the ravages of the political upheaval and war, and remained a viable military force. Under the command of Suhaib Suleiman, the Republican Guard has acquitted itself well in the Syrian war, though the heavy exposure to fighting means its units suffered unusually heavy attrition, compared to other Syrian Arab Army formations. The Republican Guard has many field achievements to its name- most importantly at the outset of 2012 when it repelled the opposition assault on Damascus. The Republican Guard was able to absorb the attack on several axes in western and eastern Damascus, successfully protecting the strategic Mazzeh Airbase and the Damascus International Airport. Supported by Hezbollah, the Republican Guard subsequently went on the offensive, clearing the Damascus area and laying siege to rebel-held areas in Western and Eastern Ghouta. The Republican Guard also deserves sole credit in quelling the massive rebel offensive on Aleppo in 2012 by sending massive numbers of fighters and armored vehicles to Aleppo in spite of still dealing with the Damascus rebels. 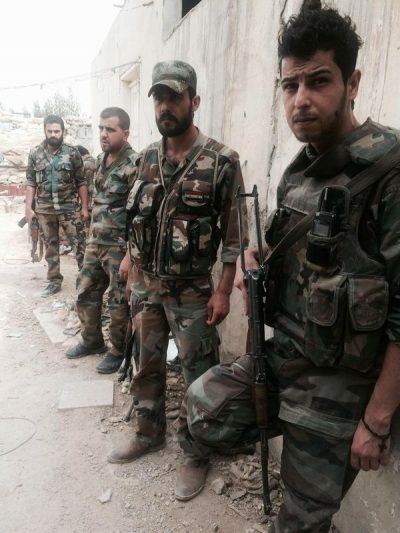 Even though the Republican Guard was not able to kick out the militants from Aleppo at the time, the elite force was blunt their assault and establish front line positions that were successfully defended until the Operation Dawn of Victory was launched in 2016 to liberate the entire city. The 800th Brigade of the Republican Guard played a decisive role in countering the Nusra offensive south of the city and recapturing the lost points. Perhaps one of the most important achievements of the Republican Guard is the perseverance of the 104th Brigade led by Issam Zahreddine in Deir Ezzor. The aforementioned brigade was sent there in late 2012 to maintain SAA presence inside the strategic city. Even with 4 years of constant attacks and brutal siege by Free Syrian Army, Ahrar al-Sham, Nusra, and most recently ISIS, the force managed to defend the Airbase and over half of the districts in the city. The Special Forces of the 124th Brigade of the Republican Guard have protected the Ithriya-Khanasser highway for two years, thus maintaining Aleppo’s lifeline to the rest of Syria. The highway is relatively safe thanks to this detachment’s efforts in repelling several Nusra and ISIS joint assaults from both directions. The Republican Guard also formed several volunteer commando units during the war, including the Syrian Marines which serve under the 103rd Brigade and which participated in the Aleppo battles in 2016, the first battle to recapture Palmyra, and Latakia operations since 2016. The Republican Guard also includes the Lionesses of Defense Armored Battalion that is crewed solely by women and which is deployed east of the capital. As for the equipment of the Republican Guard, it is still considered the top of the line in the Syrian Armed Forces. Republican Guard fighters are armed with AK-74 and AK-100-series rifles, and their units are amply provided with AGS-17 automatic grenade launchers, KORD 12.7mm heavy machine guns, and anti-materiel rifles such as the OSV-96. As for the armored vehicles, the T-72AV is the prevalent main battle tank in the Republican Guard. It is an advanced version of the T-72 equipped with the Explosive Reactige Armor (ERA). Republican Guard also utilizes BMP-2 IFVs and large numbers of gun trucks with 14.5mm, 23mm, and 57mm automatic cannon. The Republican Guard was one of the first formations to obtain the Sarab 1 and 2 protection systems in addition to the Viper-72 thermal sight upgrade for the T-72 tanks. The 100th Artillery Regiment is armed with 122mm D-30 howitzers and 152mm 2S3 Akatsiya self-propelled howitzers, along with the BM-21 rocket launchers (MLRS) and locally manufactured Burkan MLRS. With the passage of six years of the ongoing brutal war, the Republican Guard maintains its positions as the most important and powerful formation in the Syrian Arab Army even after its huge losses in manpower and equipment. It remains relatively unaffected by the current political and security situation in Syria.